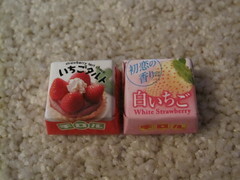 These two Tirol flavors, while both strawberry-related, did not come from the same collection. The White Strawberry came in a box shaped like a large Tirol chocolate (love when they do that), and it was the only flavor included. I can't remember ever having a white strawberry, but I read a bit about pineberries (hybrid strawberry-like berries that taste a bit like pineapple). I'm not sure if they are the same fruit, but it was an interesting read. Strawberry Tart Choco came in this year's Ichigo ga Ippai collection. Since at least 2009, Tirol has brought out a strawberry-themed variety pack with some repeats and usually at least one new flavor. Have a look at my reviews of the 2009 and 2010 editions, if you like. This time, there was only one new flavor, so I thought I'd combine it with the standalone strawberry. White Strawberry had an intense strawberry smell when unwrapped. The top inner layer was a thin strawberry gel, which was tart and authentically fruity. Some pieces leaked strawberry gel into their wrappers, adhering the chocolate to the paper - the strawberry flavor was noticeably less intense when this happened. The inner marshmallow layer nice, pillowy texture and a slight sweetness. 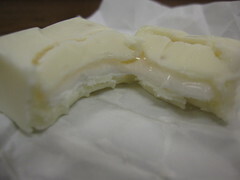 The white chocolate shell was cool on the tongue and extremely sweet. There were a couple strawberry seeds embedded in the chocolate, but they didn't add much - just a hint of a crunch like the real fruit. I liked the flavor of the strawberry gel and the texture of the marshmallow very much, but the white chocolate was just too sweet and cloying. Eating them with strong black tea helped to lessen the powerful sweetness, but the white chocolate tarnished an otherwise delicious Tirol. The strawberry flavor was delicious, so I had no trouble finishing the box, but I wish they had been less sweet. Strawberry Tart Choco had an ever-so-slightly soapy scent and flavor, but the texture was great. The white chocolate shell reminded me of strawberry yogurt, and it wasn't intensely sweet. 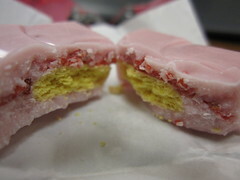 Inside the chocolate, there was an extra crunchy, flaky biscuit with strawberry-flavored crystals on top. Those crystals were tart and had a nice, authentic flavor and a neat crunch that reminded me of freeze-dried fruit. This flavor also had seeds embedded in the chocolate, and again, they didn't seem to add much to the experience. I suppose they added to the authenticity, but they really just got stuck in my teeth later. Still, this was my favorite out of the two strawberry flavors in this review, and probably my favorite in the strawberry variety pack. Nice camera :D I think I'm going to get a new camera during the summer after I get a paycheck! :D My family's been using the same camera for as long as I can remember (it's only 6 mega-pixels while everything is like 12+ now). Looks delicious. Ahh. I hate that too, the "so sweet it's burning" flavor.